Angela Yamini was 43 years old when she was diagnosed with breast cancer. She received chemotherapy before undergoing a lumpectomy and radiation therapy at Winship. Now, two years later, she is in remission and is focused on staying well so she can be there for her family. She is pictured at home with her three daughters: Kira, age 15; Kamryn, age 10; and Kaela, age 18. Kristen Sheubrooks (above) was 34 years old, the mother of a boy in preschool and a baby girl, when she received a diagnosis of metastatic breast cancer. She knew she was at high risk for the disease, but the timing seemed especially horrible, she says. "We had to explain that Mommy would be tired a lot, and that my hair would look different," Sheubrooks says. Women who are diagnosed with breast cancer before the age of 50 are usually recommended to undergo genetic testing. Sheubrooks did not need to struggle with this decision. Since her mother had breast cancer twice, Sheubrooks and her sister had been tested already and both were found to be brca carriers. BRCA: The most common cause of hereditary breast cancer is an inherited mutation in the BRCA1 or BRCA2 gene. Inheriting a BRCA1 mutation raises the lifetime risk of breast cancer in the range of 55 to 65 percent. For BRCA2 mutations, the risk is around 45 percent. HER2-positive: Breast cancer cells are tested to see if they have estrogen and progesterone receptors and the growth-promoting protein called HER2. About 1 of 5 breast cancers have too much HER2 and are referred to as HER2-positive. Triple-negative: If the breast cancer cells don't have a significant amount of estrogen or progesterone receptors and not much HER2, they are called triple-negative. Triple-negative breast cancers tend to grow and spread more quickly than other types of breast cancer. *Source: American Cancer Society. For more breast cancer terminology and definitions, go to cancer.org. She had been having regular preventive screenings, alternating MRI and mammogram, every six months since her 20s. A second pregnancy in 2014 broke up that routine. When her daughter was five months old, she felt a lump in her breast. While getting it checked, she learned that a spot also had been detected on her liver. Her local Georgia doctors recommended that she come to the Glenn Family Breast Center at Winship and enroll on a clinical trial designed specifically for BRCA carriers with metastatic breast cancer. Doctors she consulted in New York advised the same thing. The trial is testing an experimental drug called veliparib, in combination with two standard chemotherapy drugs, carboplatin and paclitaxel. Researchers think that BRCA-linked cancers, in particular, may be more sensitive to this drug. When Sheubrooks started on chemotherapy, it felt like "the worst stomach flu you can imagine, times ten," she says. But anti-nausea medications helped and later her drug regimen was adjusted to allow for the least toxicity while she remains on the study. Sheubrooks does not know whether she has been receiving veliparib, rather than placebo, but she is willing to guess that she has, because her response to the medication regimen was so dramatic. The lump in her breast is now undetectable, while the spot on her liver has been barely detectable for a few months, she reports. Women who are diagnosed with breast cancer before the age of 40 tend to develop more aggressive cancers. And BRCA1 carriers are more likely to develop triple negative breast cancer (see definition in sidebar). These are complicating factors doctors know about. But every woman fighting breast cancer faces choices. 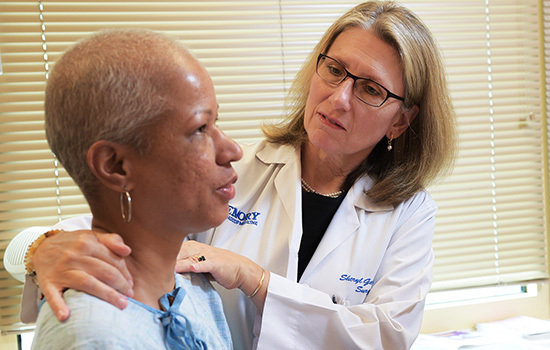 The care teams at Winship's Glenn Family Breast Center have the experience and training to advise women on the choices they must make, and to design treatment regimens for their unique circumstances. This article examines some of the complexities that can shape a woman's encounter with breast cancer. Tracey Monday was diagnosed with breast cancer at the age of 26. Breast cancer in women younger than 40 makes up less than five percent of all cases diagnosed in the United States, but this group has made up nine percent of Winship breast cancer patients in the last two years. Most young women do not get annual mammograms, so these cancers tend to be more advanced due in part to the fact that they go undetected until a patient or physician feels a lump during a physical exam. Even when comparing cancers at the same stage, breast cancers that occur in younger women tend to be less likely to be treatable with hormone therapy, and have a higher risk of recurrence and metastasis. 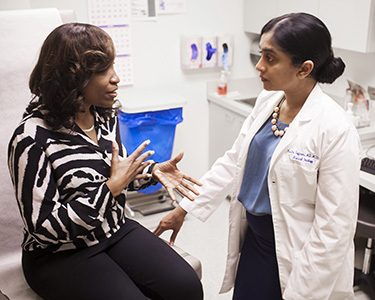 Reetu Earp discusses options with her doctor, Jane Meisel. Breast cancer treatment in younger women also brings with it unique concerns. Chemotherapy as well as endocrine therapy (such as tamoxifen) can affect ovarian function, resulting in irregular periods and contributing to early menopause. That cuts into time a woman may have planned for pregnancy and childbirth. Early menopause can affect a younger woman's health in other ways, such as reduced bone density. 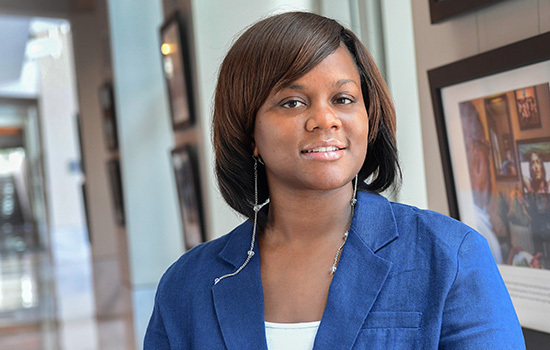 "Our team approach can provide benefits to women who have these needs," says Mylin Torres, a radiation oncologist and director of the Glenn Family Breast Center at Winship. "We make sure they have quick access to fertility consultation, genetic counseling, or a plastic surgeon, so there's minimal delay in starting their cancer treatment." 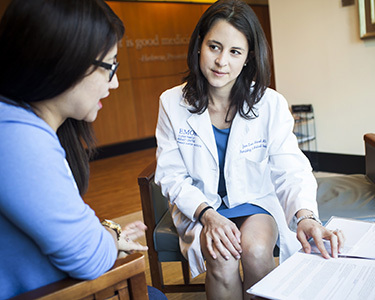 Winship oncologist Jane Meisel describes a patient in her 20s, whom she advised to consider measures to preserve fertility. The patient began crying and said that two other doctors she had visited had not brought up the topic. "These are the patients who keep me up at night," Meisel says. 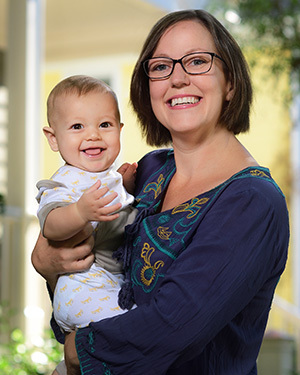 Winship patients who need a consultation on fertility can usually obtain an appointment within 24 hours, says Jessica Spencer, medical director of Emory's Reproductive Center. Options include egg or embryo preservation, drugs that may be able to reduce the ovaries' exposure to chemotherapy, and alternatives such as adoption or surrogacy. In addition, younger women diagnosed with breast cancer are advised that they should undergo genetic testing for BRCA1 and BRCA2 mutations. While BRCA1 and BRCA2 mutations are rare in the general population (estimated at 1/400 to 1/800 women), the relative likelihood goes up when someone has breast cancer at a young age. For Tracey Monday, who was diagnosed with breast cancer when she was just 26, the question of genetic risk had some sharp teeth, because her mother had undergone treatment for ovarian cancer just a couple of years before. As Monday was preparing to start chemotherapy, her mother's cancer came back. Her genetic testing did turn up a BRCA variant, but it was not identified as a contributor to breast cancer risk. for genetic counseling. A companion survey of Georgia doctors also found gaps in health providers' understanding of breast cancer genetic risk, says Bellcross, who has developed online tools to help women decide whether to undergo genetic testing. "Many women think: 'I've already had breast cancer. What difference does it make?'" says Bellcross. "What they don't realize is that with BRCA, there's an increased risk of a second breast cancer, or ovarian cancer. They don't want to have to go through this a second time." Baby Derin was a surprise blessing, born less than a year after Deja Er was diagnosed with triple negative breast cancer and only five months after she completed radiation therapy treatments at Winship. Mother and son are thriving. Pregnancy has a complex relationship with breast cancer risk. The hormones of pregnancy, such as estrogen, are thought to speed up breast cancer growth, although having children early in life also lowers the risk of developing breast cancer later. Studies indicate that pregnancy does not boost the risk for BRCA1 carriers, like Kristen Sheubrooks. And in particular, her cancer was triple-negative, an aggressive type insensitive to both estrogen and estrogen deprivation. Sometimes a breast cancer diagnosis interrupts a woman's family planning in a more direct way. After giving birth to her daughter in 2014, Patricia Jean detected a lump in her breast. Her gynecologist scheduled her for an ultrasound and biopsy, and as part of a standard screening process, she had a pregnancy test. "I had a few days to be happy about the pregnancy," says Jean, an accountant for a communications company. "When I came in to learn the biopsy results, I did not expect to hear bad news, so I was stunned and very concerned." The biopsy results indicated possible stage II cancer. It was HER2-positive, a type of breast cancer that tends to be more aggressive. The Atlanta-area surgeon and oncologist she was initially referred to were eager to begin treatment, but they strongly recommended that she terminate her pregnancy, just five weeks along. "I thought that would be a horrible thing," she says. Instead, Jean wanted to explore the possibility of delaying chemotherapy until the second trimester. Her surgeon and oncologist resisted. Chemotherapy drugs are thought to be most harmful to the fetus during the first trimester of pregnancy. However, in several retrospective studies, commonly used chemotherapy drugs given in the second or third trimester do not increase the risk of birth defects. Praying and searching for options, she read a news article about a pregnant woman who was treated for breast cancer in New York. She called that woman's doctor and was squeezed in for an appointment that week. Doctors in New York reassessed her case and developed a plan: surgery in New York, followed by chemotherapy during the second trimester of her pregnancy in Atlanta. 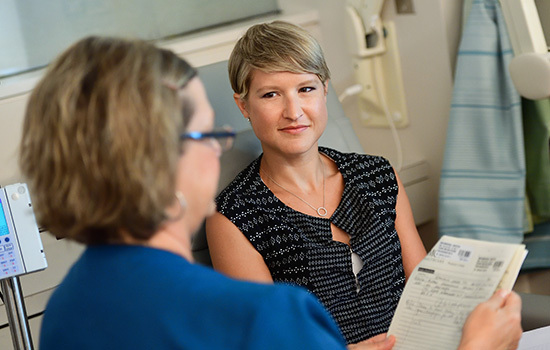 Jane Meisel, an oncologist in the Glenn Family Breast Center who had done research on pregnancy-associated breast cancer treatment, agreed to take her on as a patient. Treatment with trastuzumab was delayed until after the baby's birth because of its previously reported interference with amniotic fluid production, Meisel says. Surgery went well, but chemotherapy during pregnancy was grueling, Jean says. She remembers tears coming to her eyes when she watched the Winship nurses handling red-colored doxorubicin with gloves. Jean's son was born in April 2016, close to full term and in the normal weight range. Afterwards, she started a year-long treatment with trastuzumab. She says she does not regret her decisions. "I did a lot of research. I read about both disasters and successes," she says. "I am not worried, but I am aware. There are risks we have to live with. God helped me through every step of my journey." 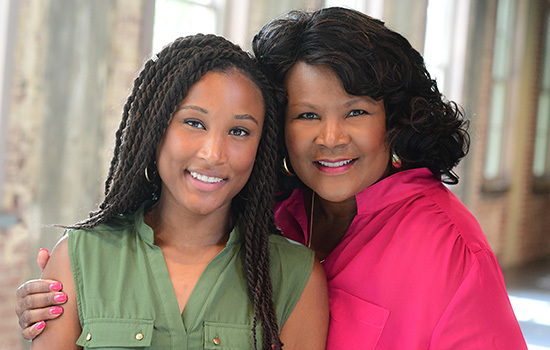 “Attitude gets you through,” says patient and Winship Advisory Board member Sandra Jackson (right), pictured here with daughter Jenna. Once estrogen-responsive breast cancers relapse, they can be difficult to treat. Sandra Jackson, who was first treated for her breast cancer in 2012, has been taking a drug combination recently approved by the U.S. Food and Drug Administration that goes beyond hormone therapy. Her regimen includes the drug palbociclib, which targets enzymes researchers think drive tumor cell proliferation. Jackson says one of the key lessons she absorbed from her first experience with breast cancer was: "Attitude gets you through." She and her family did plenty of research, mapping out the options on a white board at their home, but she also avoided reading too much about possible side effects of the medicines she would take. "I didn't want to train my brain to anticipate those experiences," she says. "But I did rest. I didn't try to push through it all." The second time around, the tumor is so far being held at bay. 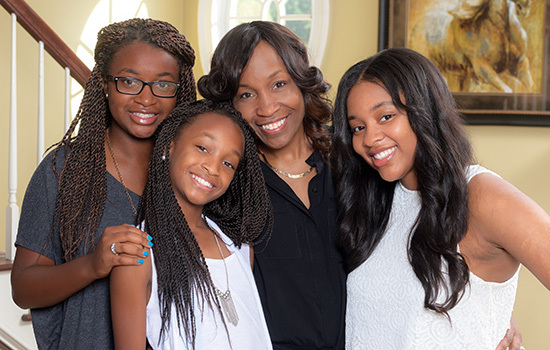 Jackson remains focused on her young, accomplished daughters: one a lawyer, the other a university sports recruiter. "Graduations, weddings, what's the next step?" 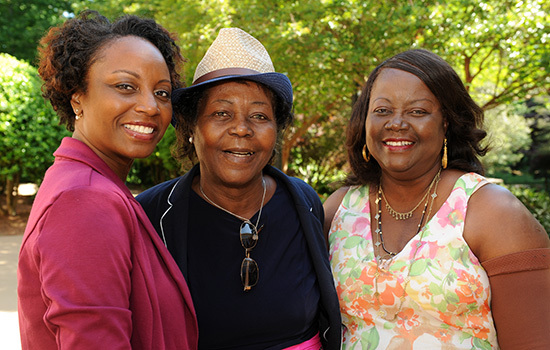 Pamela Bryant, her mother Juanita Bradley, and aunt Jennie Williams, are all breast cancer survivors. Bryant went on a clinical trial that cut the length of her radiation treatment in half. If a woman is facing a breast cancer that has spread to the lymph nodes, oncologists often recommend pre-operative, or neoadjuvant, chemotherapy. This can increase the surgical options for women who would need a mastectomy if they had surgery first, and allow doctors to gauge the cancer's response to the specific drugs chosen. A series of ambiguous mammograms in 2015 led Angela Yamini, then 43, to come to the Glenn Family Breast Center at Winship. She learned she had stage III cancer, with some lymph node spread. Yamini, who works at a big technology company, says her first thought was of her husband and three daughters: "I could not leave them. I had to be there for them." The cancer cells were faintly estrogen receptor-positive, so her team, led by oncologist Keerthi Gogineni, made a decision to treat it like a more aggressive triple negative cancer. In her case,chemotherapy eliminated signs of cancer from her lymph nodes by the time of surgery. Angela Yamini with her doctor, Keerthi Gogineni. Instead of having the entire breast removed, she opted for lumpectomy with radiation. At the same time as the lumpectomy, Yamini also was able to have oncoplastic reduction, a plastic surgery technique in which the breast unaffected by cancer is reduced slightly to match the one where the tumor was. "I had a number of conversations with [Winship surgeon] Dr. Styblo with notebook in hand, talking about the different options," she says. Yamini was able to choose the less radical surgery, knowing that recurrence rates for both procedures were approximately the same, Gogineni says. Yamini appreciated getting the information she needed to make treatment decisions. During her treatment, Yamini's colleagues brought her meals, and she worked at home. Now she is back to her regular work and home life and taking tamoxifen to reduce the risk of cancer recurring. She says she has some fatigue but is feeling more like herself again. "Cancer is in the rearview mirror," she says. "I'm stronger every day." Read "Decoding Genes, Boosting Quality of Life for Breast Cancer Survivors." Black women diagnosed with breast cancer in Georgia are 29 to 32 percent more likely to die from this disease than white women diagnosed with breast cancer in Georgia. This disparity can be attributed to some biological factors, such as black women being diagnosed with more aggressive subtypes of breast cancer, but access to screening and quality care may play a role. Under the direction of Winship’s Sheryl Gabram-Mendola, surgeon-in-chief at Grady Memorial Hospital, a partnership between the Glenn Family Breast Center at Winship and the Avon Foundation Comprehensive Breast Center was formed at Grady to provide better breast health services to women in underserved communities served by Grady. The Avon Breast Center has a multidisciplinary program offering clinical and support services, including screening, diagnoses, treatment, genetic counseling, patient navigation, and laboratory services. Through this initiative, the Avon Breast Center has been able to detect more early-stage breast cancers, reduce the number of women with late-stage diagnoses, and improve access to screening services in this community. When Pamela was diagnosed with triple negative breast cancer at age 48, she came to Winship to get the most advanced treatment for this aggressive cancer. The Glenn Family Breast Center at Winship helps fuel the kind of research that can lead to better treatments for patients like Pamela.